Our copy of Potion-making: Practice was kindly supplied by the great people of RightGames. Russia is not a country many people think of when talking about boardgames. But gaming has been growing more popular there, and now Russian publishers are entering the global game market with their own games. Take, for example, RightGames: they have translated a handful of Russian games to English and are pushing to make them known worldwide.Their games are also quite popular where available: they sold out in Essen very quickly, and the stack they started with wasn’t small. The first RightGames game we tried is Potion-making: Practice, a card game that should be instantly popular with any Harry Potter fan because you get to create magic potions, elixirs, talismans, cookies and magical creatures. Okay, I lied. You cannot make cookies. However, this class in potion making is a long way away from the organised affair that is a Hogwarts class, where everyone prepares their own ingredients and takes care to stir their cauldron counter-clockwise. For starters, no one prepares their own ingredients here: they all come from the Desk of Elements. When you were in school, did your teacher ever give you a project, then put a huge box of parts on the table and told everyone to just get what they need? Because mine did, and Potion-making: Practice captures that feeling perfectly. I’m still the sad kid that looks into the Box of Elements with nothing left but Quintessence of Will, a wilted Fern Flower and a jar of shoe polish that no one knows how it got there, a combination that not even the greatest of alchemists could cook anything useful from. Putting ingredients on the Desk of Elements is one possible move on your turn, usually when you have nothing better to do. The bottom part of the card shows one of the 16 ingredients for your mystical workings, and putting a card on the desk awards you a point if that ingredient wasn’t available before. The more interesting move – and also the one more likely to let you pass your potion making exams – is to cook a potion or other alchemical peculiarity. To do that, you use the top part of a card, the formula. A formula shows the ingredients needed plus the result. 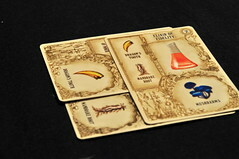 To cook the formula, the formula card itself has to come from your hand, but all the ingredients have to come from the table. Even if you have Mandrake Root and Bloodstone in your hand, you cannot make a Love Potion unless those two things are available from the Desk of Elements. Since you can only play one card per turn, every other player gets a chance to use your Mandrake Root before you if you put it down, so you can guess how often you get to use your own ingredients. Opportunism is the way to victory here: when you see the ingredients for a formula that you have, cook it now because you might not get another chance. But making potions from the basic ingredients on the Desk of Elements is only half the fun. When you do, you score points place that formula on the table in front of you – with the ingredients safely tucked behind it. But now the potion is on the table, and as we remember: everything on the table is an ingredient and can be used to create new things. From an Elixir of Fire and an Elixir of Eternal Youth, for example, you can cook up the Great Elixir of Revival. Or some mean Margaritas, but we’re still in Potions class so you might want so skip that. From an Elixir of Eternal Youth and an Elixir of the Master of Plants you can create the one, the only, the fantastic Avocado Homunculus. Read that again, in case it didn’t register the first time: Avocado Homunculus. At this point I’m basically convinced that the formulae are copied from a real book of alchemy from a wizarding school somewhere. Avocado Homunculi are not something you just come up with, they are something that happens when you spill your cauldron onto your lunch back on Guacamole Day. These advanced formulae are worth much more points than the measly two you win for a basic elixir. Our perseaian friend is one of the more valuable creations with eight points, and when you get tired of him you can still squash him back into a Mexican dipping sauce and enjoy your lunch. Potion-making is a highly collaborative art and more often than not the potions you use in your advanced preparations were not created by yourself. If you recycle one of your opponents’ unimaginative creations into something much more elaborate and interesting, you give them some credit for their work and they gain half the points that you just earned. When you’re clearly the better alchemist, you can afford to tell the teacher how helpful the others were. Spicing things up a bit more are three magic spells you can cast on your turn, if you’re lucky enough to get the rare spell cards. I’m sure that in an exam situation, using spells to create your potions is highly illegal, but we’re only in potion-making practice here and the professor can’t look everywhere at once. Except maybe with an Elixir of Secret Sight, but I digress. All the spells let you use a card that was played as an ingredient as a formula instead: with Eureka! you may take a card from the Desk of Elements to your hand, effectively turning it into a formula, with Decomposition you unmake one of your own creations but place one of its component cards as a finished creation in front of you and with Transformation you turn one of your creations into a formula from the Desk. With all three spells you still take your regular turn after casting them, so they are extremely useful to set up a valuable formula and let you use it before anyone can steal your ingredients. With all the card drawing, having to find the right ingredients for your formulae and hoping for a spell to find its way to your hand occasionally, Potion-making: Practice requires a some luck to win. It doesn’t matter how good you are at what you’re doing, if all the formulae you have require Spring Water and none is available, you’re not going to score points. But beyond the luck, there are interesting decisions to be made, mostly involving which cards to keep. You’re rarely fortunate enough to decide which formula to use, most of the time you won’t find the ingredients for more than one that you could cook. But which cards you put to the Desk is often not a simple choice as you want to make sure to have a decent mix of formulae left in your hand. You don’t want to waste a formula that has half the ingredients already available, or one that is worth ten points, or one that uses only basic ingredients in case you cannot make something bigger. In fact, maybe only making basic elixirs and hoping for the points from other players using them might be profitable as well. 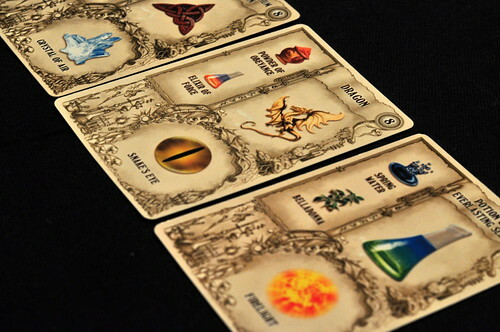 Some more strategy enters the game with the spell cards: when and how to use them makes a big difference on your final score. I’m not going to lie to you, though, Potion-making: Practice is not a complex game, and strategy will only take you so far. It is, on the other hand, a brilliant family game that will make your kids happy with the setting and still has enough meat to eat that you can bring it out and have some fun with your gamer friends on occasion, when everyone is exhausted from a long, deep game you just finished. In the latter case, complaining becomes an almost essential part of the game. Complaining about the lack of an ingredient, complaining about other players stealing your ingredient, complaining about no-one making the elixir you need to finish your own formula. We all know how much gamers love to complain about these things, so giving them an outlet for that can’t be bad. Despite – or maybe because of – the luck required, it feels very satisfying to create something like The Supreme Elixir on your last turn from ingredients your opponents just finished after you held on to the card since the beginning of the game. 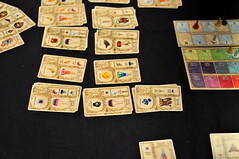 And maybe the two expansions Potion-making: University Course and Potion-making: Guild of Alchemists add enough complexity to turn this game into the evenings main entertainment when they become available in English. One big kudos goes to the games artist(s) that not only managed to create pretty, thematic cards but also depicted all the different potions and elixirs in a way that you can tell from the other side of the table whether the one you need for your formula is available or not. It had been dark for a while now, classes had ended hours ago. The Avocado Homunculus – or Avi, as he preferred to be called – silently came out of his hiding place behind the garbage bin where he had been so carelessly tossed as a failed experiment after seemingly failing to come to life. Now, if he could only get the Elixir of the Master of Plants from the top shelf, he would be able to turn the discarded breakfast fruit, so unloved by its owner yet so attractive in his eyes, into a Kiwi Construct, and they could elope together, to a tropical island somewhere, maybe start a small forest. That was Avi’s last thought, before the janitor stepped on him while taking out the trash.